Silent Film of ESCRU Gathering, 1964. 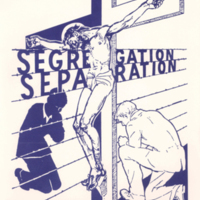 Powerful imagery used by ESCRU, borrowed from the anti-apartheid movement. A poster featuring the ESCRU logo. 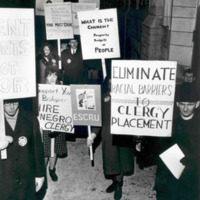 A protest demanding the dissolution of racial barriers in the placement of clergy, c. 1966. 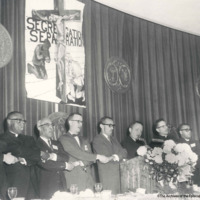 ESCRU Third Annual Meeting held in Washington, D.C., 1963. 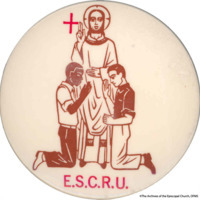 A badge featuring the ESCRU logo. 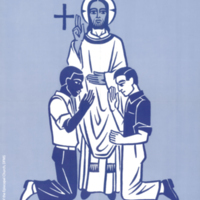 ESCRU outreach materials employed powerful imagery. ESCRU Statement of Purpose, outlining the tenets of the organization. 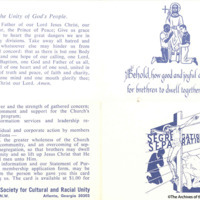 Letter written by ESCRU Director John Morris thanking Presiding Bishop Arthur Lichtenberger for his statement (also included) which called for Episcopalians to support the nation-wide civil rights protests, May 1963. 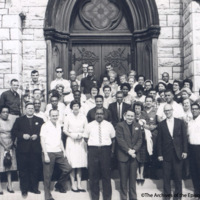 ESCRU delegates gathered in front of a Cathedral in Chicago, Illinois, in 1962. John Morris is front row center.